The Wyoming County Commissioners have called for an emergency meeting of the Wyoming County Prison Board on Wednesday, Aug. 24, at 11:30 am in the commissioners chambers at the courthouse in Tunkhannock. The number of inmates sentenced in the county continues to climb, despite having no place to put them. Despite a sparse printed agenda for Tuesday’s regular meeting of the Wyoming County Commissioners and the absence of Commissioner Ron Williams, numerous important issues were brought to the table. Foremost among them is the continued outsourcing of new inmates sentenced to the Wyoming County Prison system, the spending of Act 13 (Impact Fee) funds to offset the cost, and calls from addiction advocates for more proactive and less reactive spending. 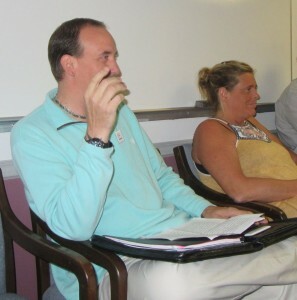 Forkston resident and founder of Not One More-Wyoming County Lizz DeWolfe (below, right) challenged the logic of spending more than $75,000 a month to house prisoners in other counties – many of whom are first time offenders with drug addictions – instead of funding treatments centers, transitional housing and programs geared to those with addiction. It would be less costly in the long run to the county, she suggested, and put those with addiction on the road to recovery more quickly. “We need to stop treating addiction as a crime, and start treating it as the crisis it is,” said John Fabiseski (above, left), Trehab certified recovery support specialist. In a separate presentation, Fabeseski implored the commissioners to look into options for daytime reporting facilities, community centers, and a more consistent and compassionate judicial system. While Act 13 funds were primarily created to be used by municipalities to offset the impact of the natural gas industry, Wyoming County is currently using a large share of that revenue to pay boarding fees on average of $65 per day per prisoner under the pretext of “public safety.” Much of that money was previously going to first responders and the county’s EMA center for technical enhancements. While Commissioner Tom Henry contended that the county still appropriates Act 13 funds for a number of worthwhile projects, he lamented the drain on the account for prison outsourcing. The recent arrests of nearly two dozen people on drug charges has compounded the prison population problem, and the commissioners have responded to the crisis by calling an emergency prison board meeting for Wednesday, Aug. 24 at 11:30 am. Henry announced that the presence of all board members, as well as the judge and chief of probation, has been requested. DeWolfe, Fabiseski and Celeste Kranick, who was also in attendance, represent a variety of groups and initiatives to provide support and resources for victims of addiction and overdoses. They came together this spring to organize the very successful Not One More rally on courthouse square on Aug. 11. The commissioners meeting provided an opportunity for a casual debriefing of the event. Henry and Commissioner Judy Mead said that they had heard many “good things” about the rally via phone calls and emails. “A lot has happened since that day,” Henry related, adding that he knew of at least three people who had been led to recovery resources. Kranick, local lead of An Addict’s Mom, was pleased to report that she had led four people to recovery since the rally. While successful in bringing like-minded people together to share their stories of addiction and hope for recovery, the event also brought to the surface some open wounds and unanswered questions, she noted. Henry thanked the public speakers and said that it was a “good conversation” that he was happy to have. Check back to www.endlessmtnlifestyles.com later to read of some developments during the commissioners meeting concerning several county-owned properties.